This is a fun and delightful adaptive reuse project! I really like how they pushed up the roof and made the entire band between the old brick shell and the new roof transparent, letting lots of indirect light flood inside (a very different quality of light than the typical stage lighting) while, at night, becoming a beacon announcing the theatre. Even more so, I love how the original brick walls are celebrated, with all their texture and the marks of time becoming part of the interior experience. The new roof and support amenities are supported by a new, independent, steel frame. The steel is black, while the new interior partitions are of plywood and black panels. 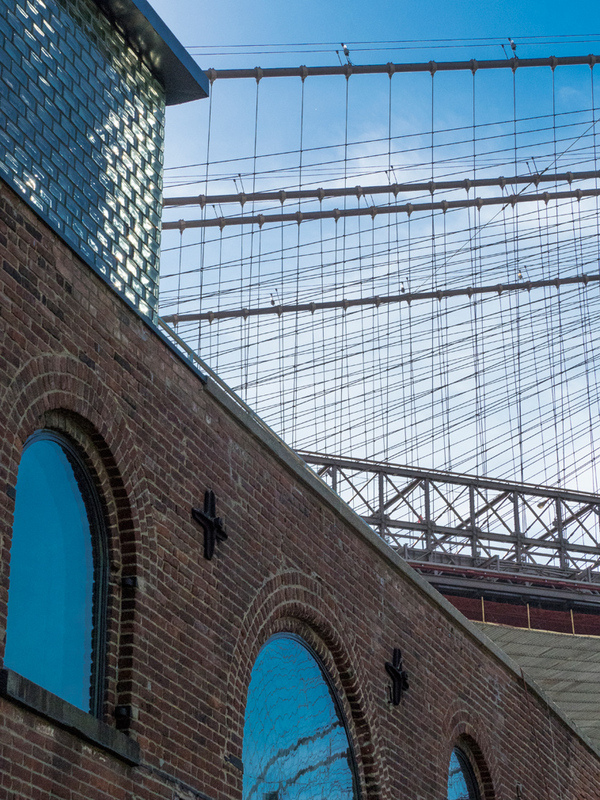 A roof deck lets patrons take in the surroundings, including the Brooklyn bridge looming large overhead. It’s bold, it’s open, it lets the materials do a lot of the talking. With just a little love and some fine design savvy (by Marvel Architects), this otherwise unused block of bricks has become part of the community once more.